Godolphin's good week continued - as did that of Darley Stud - when Old Persian, a son of Dubawi, won the G2 King Edward VII Stakes. 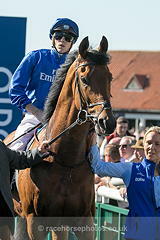 The Charlie Appleby-trained winner was given a fine ride by in-form William Buick, beating Rostropovich and Giuseppe Garibaldi by one and three-quarters of a length and a neck. Appleby: "We had a great team of two-year-olds last year, and I felt they all wintered well and came into the spring in great nick. This horse has done nothing but progress through the spring, and we felt this was the right race for him and that stepping up in trip would suit. "We were confident and I told Will to go forward with him, and if someone wanted to take the lead, then we would be delighted. "You saw William make a great manoeuvre after the first two or three furlongs. He just sat on Frankie's quarters because we know Frankie on the front end is always dangerous, and when he looked through his legs and had everyone stacked up behind I knew William was in the right place. "I was so pleased half a mile out with the way he was travelling and once this horse hit the front I was confident he would see it out well given the pace they had gone. He had shown a turn of foot over a mile and a quarter so I knew what he could do. "He's a typical son of Dubawi - he's improved from two to three and I'm sure he will progress from three to four. We wanted to mind him because we liked him and felt he had the scope to become a good horse. It's still a building stage. [Ex-jockey] Oscar Urbina rides him every day now, but Jen, who led him up, rode him as a two-year-old but happily held her hands up and said he had become too much for her between two to three so Oscar popped on and it's worked out well and produced him for today - it's a real team effort." Asked if the William Hill St Leger could figure in Old Persian's plans, Appleby said: "William said it could be something to keep an eye on, but I'm happy to stay at a mile and a half given the pace he has shown at shorter trips. I've put him in the Grand Prix de Paris [run in July], and that is one for option. "I am delighted for the whole team. This is what Royal Ascot is all about."